Drinking water fountains are a great way to provide chilled, clean water in your office or home environment. Drinking water fountains are especially popular in areas occupied by large numbers of people including larger offices, schools, universities, event centres and other areas where water is in high demand. As they are usually produced from hardy materials such as metals or ceramic, drinking water fountains are more sturdy than bottled water coolers. This is especially important in environments where the water fountain is used throughout the day or is situated in harsh surroundings. Other water cooler options such as bottled water coolers need to be refilled regularly, and the bottles also have to be cleaned when refilling. Drinking water fountains are hooked directly to the local plumbing system, the internal workings of the drinking water fountain are more simplified and do not break or require maintenance as often as other water coolers. Water fountains are able to dispense more water than bottled water coolers, and at a faster rate. Drinking water fountains are able to dispense between 20 and 50 litres of chilled water per hour, depending on the individual fountain’s pump system. Other kinds of water coolers such as bottled water coolers require you to purchase plastic bottles, pay for electricity to run the filtration system and pay to replace various parts. Drinking water fountains make use of the local plumbing system leading to lower maintenance costs. 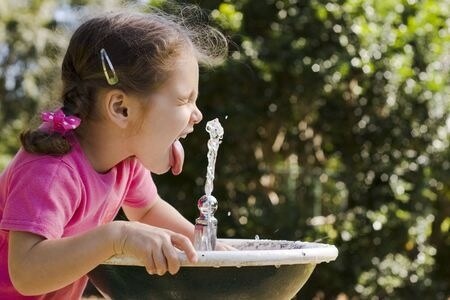 Drinking water fountains are made from environmentally friendly materials such as ceramic. Bottled water coolers often use large plastic bottles which need to be replaced regularly, as well as making use of plastic components which also need to be replaced time to time.